Drop Everything And Make It! Uh, can we say, "She's singing my song?" There are those of us quilters who bounce along doing what we're supposed to, and suddenly a wild idea comes along that is SO tempting we throw abandon to the wind, and divert. Not unlike a dog who is squirrel crazy, and spies a squirrel! Nothing else moves them until they give all their attention to that pesky squirrel. Oh, boy, does that mean me this month! I had a very big squirrel. I had been putting away my loot from Black Friday deals, and it wouldn't fit. Those of you who know how much storage I have will attest that it was high time to move fabric. My choice of destashing is use it up for charity quilts. 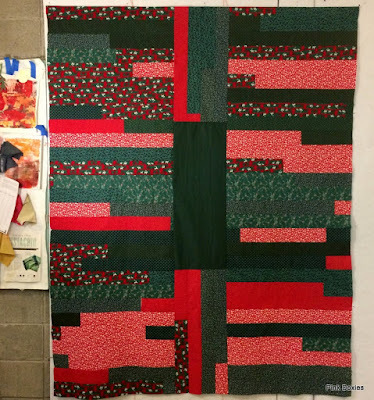 All these quilts were either made 'so far this month' in the studio, at home, or laid out on the design wall at the Connections Thrift Store in Kidron, Ohio for volunteers to sew and tie into MCC comforters there. Quilted, trimmed, and binding made. The Queen needs side borders yet to bring it up to size. How impatient I am to tell the story of this quilt's name! Soon, I promise. It's my motivation to get it finished. But the biggest squirrel of all happened when I was asked if I wanted help out regularly in the quilt room. This is a part of the Connections Thrift Store in Kidron where comforters are made and tied both for sale there in the store, or sent abroad for relief around the world where there is need. Sure, I did! They are all wonderful quilts! I really love how your 'queen of the borders' quilt is going! You got squirreled big time. 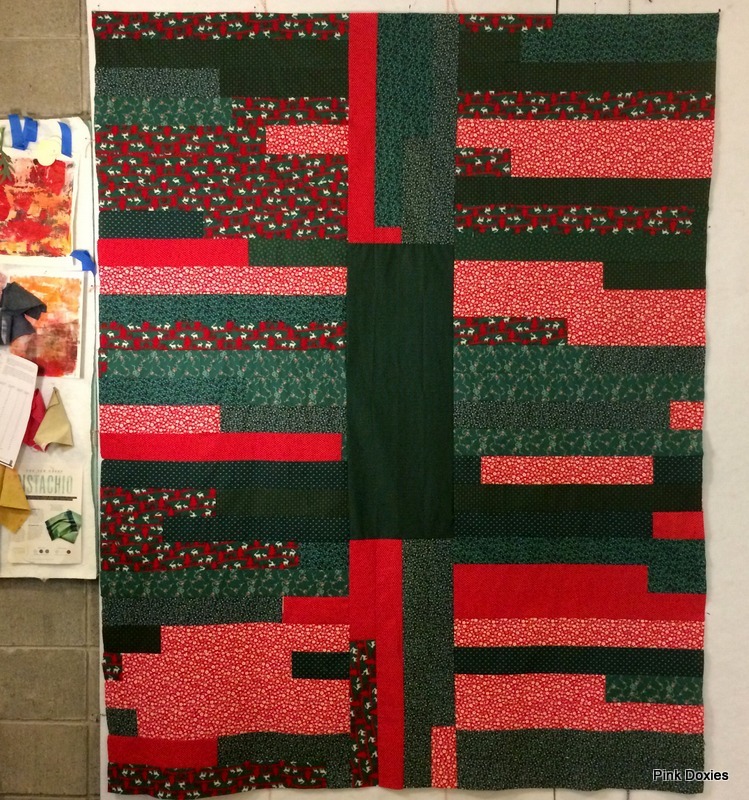 All your charity quilts are great. Love all the different layouts. Thanks for sharing the link. That concept is really something I need to take to heart. 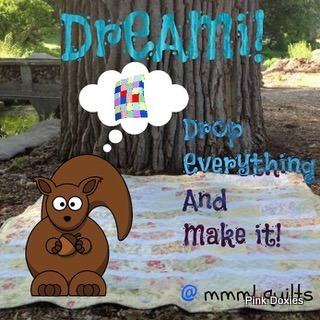 Wonderful how your squirrel has lead to producing charity quilts and using up your stash! I've been seeing them on Instagram and on your blog but to see them all here in one place--WOW!! LOVE the eyes-flowing across the quilt that you've achieved with each one of them! I also was thinking, "Gosh! She has the best quilt names!" and then you said you will tell us about the Cherry Ridge one! Super work for such a wonderful cause, and on top of it (ha the cherry on top, wink) is you adding to your donation of quilt tops and design with your time on Fridays at the shop. Love that. Thank you so much for linking up with my first linky! Your squirrel is definitely a productive one! You've got lots of good stuff to show for your destashing efforts.